When I was a child, I ate primarily two foods groups: foods one ate with ketchup, and foods one at with ranch dressing. Vegetables nearly always fell into the latter food group, and setting the table included bringing out the bottle of Hidden Valley Ranch. Soybean oil, water, egg yolk, sugar, salt, cultured nonfat buttermilk, natural flavors (soy), spices, less than 1% of: dried garlic, dried onion, vinegar, phosphoric acid, xanthan gum, modified food starch, monosodium glutamate, artificial flavors, disodium phosphate, sorbic acid, calcium disodium EDTA, disodium inosinate, disodium guanylate. Soybean oil is a highly refined oil that may disrupt hormones, due to the phytoestrogen content, and may contribute to inflammation, due to the omega-6 content. Monosodium glutamate (MSG) is a neurotoxin. It’s not food. Artificial flavors is a blanket statement for “chemicals not revealed on the label because it will gross you out.” Artificial flavors are chemically extracted from inedible substances, including petroleum. Nonfat buttermilk comes from feedlot cows, and their milk often contains the hormones and antibiotics they are given to produce unnatural volumes of milk. I avoided ranch dressing for years, when I couldn’t find a safer store-bought option. 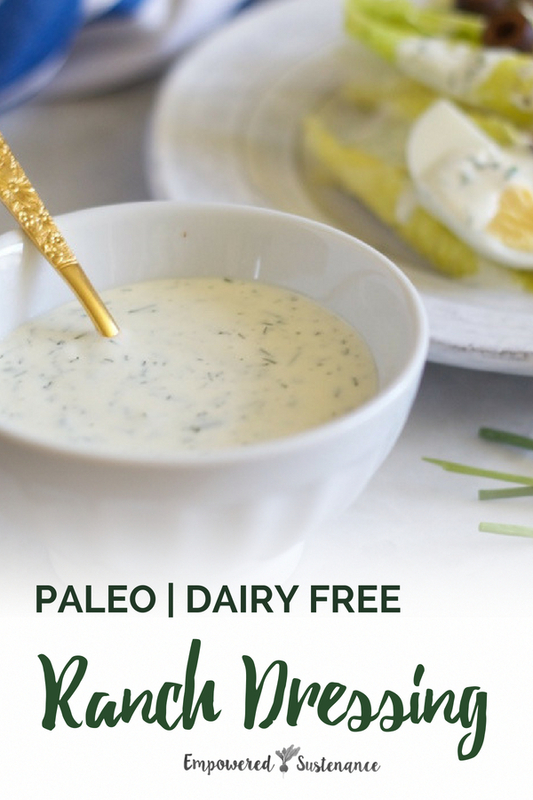 Then, when I began a grain-free and dairy-free diet to heal my autoimmunity, I thought I would never be able to recreate ranch without the traditional ingredients of sour cream and buttermilk. I’ve happily proved myself wrong. Healthy mayo — Most mayonnaise contains the highly-refined vegetable oils (corn, safflower, soy or canola oils) that contribute to inflammation and chronic disease. I highly recommend Primal Kitchens Mayo, which features avocado oil. Because it contains only quality ingredients — the same ingredients used to make mayonnaise at home — it’s the best-tasting mayo you’ll ever buy. I’ve worked with Thrive to offer you a free jar of Primal Kitchens Mayo, as a gift-with-purchase. Canned coconut milk — You want to use canned coconut milk here, because it is much creamier and richer than any other non-dairy milk. You can use full-fat or light canned coconut milk. Fresh herbs — A few tablespoons of fresh herbs elevates the flavor to the true essence of ranch. Dried herbs don’t do justice. This dairy free ranch dressing relies on the flavor of fresh herbs, instead of MSG and refined sugar found in store-bought ranch dressing. Whisk together all ingredients until creamy, or use an immersion blender to make quick work of the mixing. Extra dressing keeps in the fridge for a week. Thank you Lauren for all the resources you share..love reading the blog..website and stories. I can’t have any coconut products. What do you recommend to use as a substitution for the coconut milk? Thanks! What can I substitute for the coconut milk? If you can do dairy, you could use heavy cream. Other non-dairy milks will be too thin, and make the dressing a bit watery. 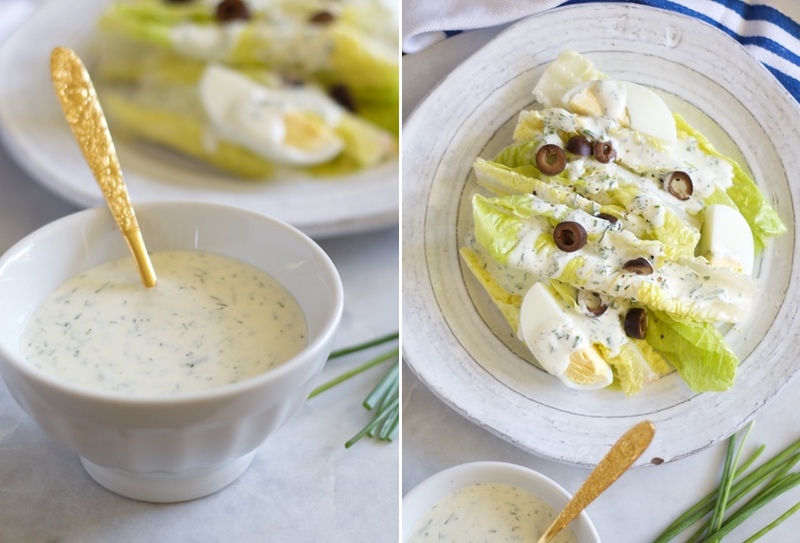 The romaine salad in the photo looks so delicious; love your photos. Can’t wait to make this dressing. Heading out now to get some avocado oil to make my mayonnaise. Thanks, and I hope you enjoy the recipe!